Well, this is it. Tomorrow I'm flying from London to Montreal. Over the weekend I took a break from my preparations; my friend Alex came to visit, and we went to see Margaret Atwood give a talk on her new novel (no big deal, only one of the best writers ever). Now I am face to face with a suitcase that looks a lot smaller than it does on the outside and a lot of stuff that I need to cram into it. I am feeling a sort of indescribable, numb panic, hence this post. Priorities. Nobody likes packing. The closest you may get to liking it is that sort of night-before excitement you feel about seeing a new country and experiencing a new culture. Usually that applies when you go on holiday for a week or two, though. And that excitement is often most deeply felt when you're a child - at least, it was for me. As you get older, you stop tagging along on holiday with your parents and start planning your own trips. And that's when it hits you that going on holiday is actually pretty stressful. You alone are responsible for paying for it, sorting out transport and accommodation, having all your important documents with you, showing up on time, and getting your bearings in your destination. Only this time, it's not a holiday. 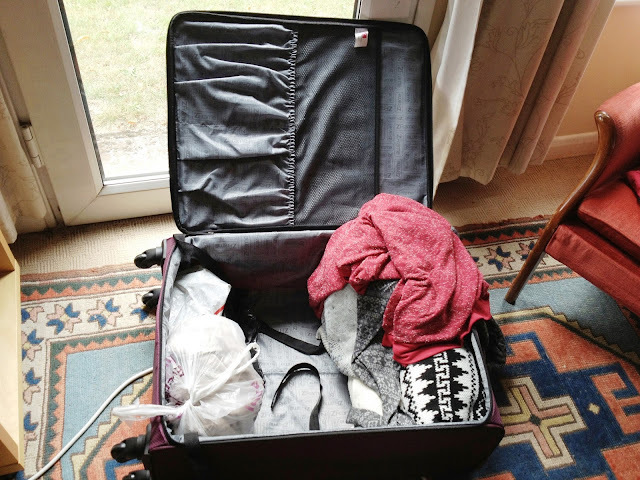 I will be living about 4,000 miles away for a year (although I suppose I should start getting used to measuring distances in kilometres) and I am finding that a 23kg luggage limit just does not suffice to this end. In fact, seeing as the suitcase itself claims to weigh 2.75kg, it's basically only 20kg for me. Sigh. I realise that I don't need to take everything with me, I can buy most of the essentials there. But still! I decided that I won't bring any teabags with me as I don't have space. Besides, I guess I'm aiming for a true North American experience where tea is going to go from being what is currently a several-times-daily necessity, to a mere luxury. Now that I'm no longer going through the stresses of uni and the dastardly effect it has on your sleep cycle, I tend not to drink coffee that often anymore, but maybe I will have to learn to embrace it as my go-to hot drink. A measuring cup I got for about £4 at Morrisons a while ago, thereby eliminating the need for scales when cooking and baking. Every student or snail needs one! Anyway, I'll be staying in Montreal over the next few days for orientation with around thirty other ELAs. Then begins the bus trip that will take most of us to our placements (those going in a different direction will be picked up personally by their responsable). Google Maps indicates that it takes six hours to get to my town, but in reality it will probably be much longer as people are getting dropped off along the way. I am very much looking forward to being in Montreal again; it will feel a bit strange but hopefully nice too, even though I'll be on my way again in the blink of an eye. I've been keeping up with the weather there; seems it's going to be slightly milder than before, seeing as this time it's September and not the middle of June. When I was there last, it was so humid that I'm surprised I didn't melt away in the street and disappear down the drain. In many parts of Britain, we've experienced a "heatwave" this summer. While it's been annoying and uncomfortable - give me back my cold winds and rain! - at least the heat has been pretty dry where I live. I am anticipating a culture shock. There is going be a whole lot to take in, and not just language-wise! I'm glad this will be my second time in Quebec; even though my previous stay was only a week, I've still got some idea of what a few key differences are. At the same time, I am trying not to build up any huge expectations. I want to take everything as it comes and appreciate everything for what it is. The next few weeks are going to be extremely busy, but I will try to make my next instalment informative, whenever that may be!